Given how frequently a good dexterity game gets played in our home - especially when we have friends and family over - I'm always on the lookout for new titles. That's why when I first heard about Suspend from publisher Melissa & Doug, I didn't need much convincing to give this a shot. It's like Jenga in that you are balancing things, but it immediately struck me as more fun and more entertaining. So let's show you what you get, how it works, and tell you what I think. My game came in a long cylindrical plastic tube. It's not exactly the most standard form of game packaging - but then again, this isn't your standard form of game. How else are you going to package long wire rods with twists in them? So while unusual, this is practical, and it does mean that you can easily squeeze this game in between others of your game collection, or even under a couch or behind some books. The tag line gives us some idea of what to expect: "Suspend - the Teetering, Wobbling, Shifting, Tipping, Unbalanced, Balance Game!" The basic concept is further explained as follows: "Hang a piece and the puzzle moves, the balance shifts and everything changes! Suspend looks different with every turn, but the challenge remains the same: don't knock it down!" So what's inside the plastic canister? Let's take a look at all the individual bits and pieces, and explain what they are for. The colour die simple is used to randomly select one of the rods by colour. 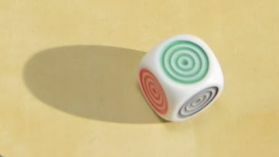 There's six sides on the die, corresponding to six different colours of rods in the game: red, orange, yellow, green, blue, and black. The first thing we get is a wooden base, which you'll have to assemble with metal rods at the start of every game. The wooden base has pre-drilled holes into which the metal support rods neatly fit. Two of them go into the sides, which go out at right angles and function as ground supports to ensure that the whole structure doesn't easily tip over. One of the remaining two metal rods goes vertically into the top of the wooden base, where a wooden connector piece joins it to the last metal rod. The metal rod at the top has a small S style bend at the top, and is where the metal rods used by players will begin to suspend from. 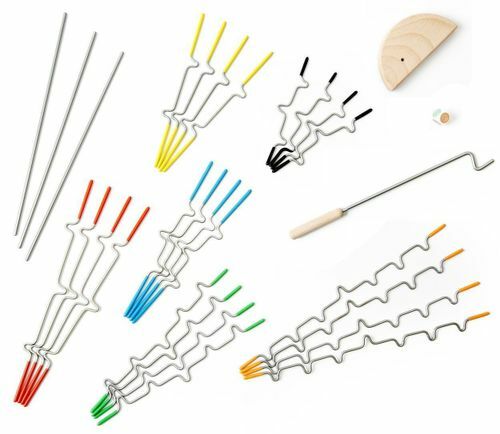 The 24 metal rods come in six different colours, i.e. four identical rods in each colour. While the metal is plain, the colour is provided by coloured and rubberized ends, which also ensure that you won't easily injure someone or accidentally poke them with the ends. For most of this review, I'll just refer to these rods as "pieces". Each different coloured piece has a different length, and also a matching series of notches/curves/twists that will assist in having the metal pieces hang from each other. The game rules are included on a single sheet of player that fits inside the plastic canister - one side effectively becomes the game box label, while the other has the instructions. You can download the instructions from the publisher in PDF format here. 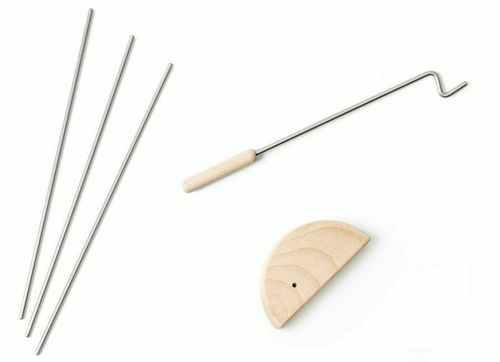 First you assemble the wooden base with the four metal rods and wooden connector. Then the metal rods/pieces are shared out, each player getting the same number of each colour, and extras (if any) going to a draw pile. The basic objective is to be the first player who gets rid of all their rods/pieces, by hanging them from the structure, taking turns to place one at a time. But there are some rules for placement: You can only use one hand when placing a piece. And once you let go and remove your hand - your turn is done. You can hang your piece anywhere, except on a notch or straight section already used by another piece. If after letting your piece go any other piece touches the ground, you need to reposition your piece. Finally, any pieces that fall during your turn, get added to your pile. That's really all there is to the basic game! Beginner: As described, but players must begin with their longest piece and work towards their shortest one. Intermediate: On your turn you roll the die to decide what coloured piece to place. If you don't have that colour, must take one of that colour from the draw pile or from another player. 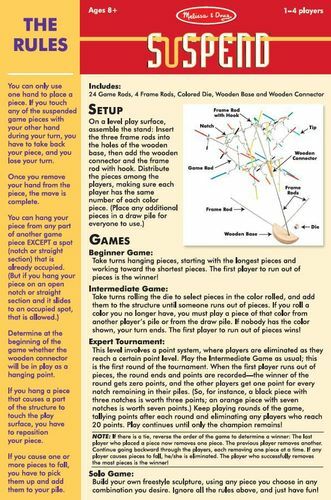 Expert: Use the Intermediate rules, but with the addition of a point system: each round the winner gets zero points, but other players get one minus point for each notch remaining on the pieces they haven't placed. Players with 20 points are eliminated, until just one person remains. Solo: Build a freestyle sculpture, using any piece of your choice, in any combination desired. It can be hard to visualize how this game works, because of the shifting balance that happens whenever you place a new piece. One of the best ways to get a sense of game-play is to check out a couple of videos of the game being played. 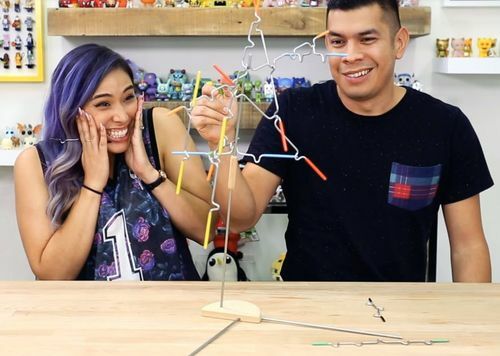 The guys at ToyBoxCollectibles were learning the rules on the go, but their game-play video will give you a good idea of the suspense and tension involved in playing! Just check some of the videos for yourself, and you'll see that the facial expressions aren't fake or staged - these are the kinds of reactions that the game genuinely produces, as it teeters and totters, and swings in different directions! Dexterity: As I mentioned at the start of this article, dexterity games have a value that few other games can have, in terms of the mileage you can get from them. This game introduces some randomness by means of the dice, but for the rest it's all about your dexterity and skill in judging the underlying physics of balance, gravity, and weight, and making good placement. It's definitely good for developing hand-eye coordination and fine motor skills too! Accessible: The beauty about a game like this is that anybody can play it. There's no skill thresh-hold that requires a certain IQ to grasp the rules, or that excludes youngsters or seniors. People of all ages and abilities can join in. Quick: Another strength of Suspend is how quickly it can play. 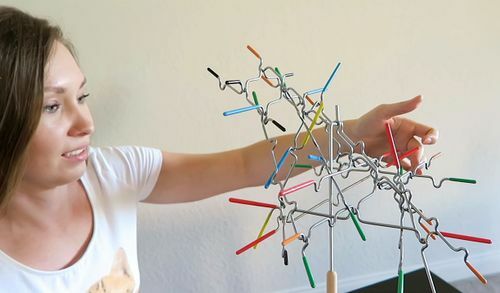 Usually you can polish off a game in 10 minutes, which is ideal for a dexterity game. That means that you can easily rotate new players in or out, especially in a party or social context where there's a lot of people. It also helps keep the game fun, and prevents it becoming too serious. Simple: The concept of the game is very simple to grasp, and an outside observer only needs to watch for 30 seconds to understand how the game works. That means that there's no downtime needed in giving a lengthy rules lecture in advance, and that you can quickly explain the game and get right into playing it and having fun. Quality: I was immediately impressed by the quality of the components, aside from the plastic canister, which is probably the weakest link as far as components go. But the metal rods/pieces are polished, smooth, and look classy, and the coloured plastic ends not only serve as a safety feature but also add some visual colour and style. I hope that the holes in the base into which the metal rods are inserted don't wear over time, but they are recessed fairly deep, and overall it looks like there's good reason to expect the game itself to go the distance, meeting high standards of durability as well as being visually pleasing. will inevitably cause people to ask about it and beg to play. The eye-catching nature of Suspend is especially the case when a game is in progress. Unlike Jenga, the structure is constantly moving and changing every time a new piece is added to it, as the gravitational forces do their work. It is inevitable that when people are playing the game, it will attract the attention of bystanders, who will want to join in. Familiar: Almost everyone is familiar with Jenga, and there is a Jenga concept that is at play in Suspend, in that you're effectively adding something each turn, and trying not to have the whole thing tumble over. Having a connection with an established and familiar game helps people understand how Suspend works, and enhances its accessibility. Unique: Although Suspend shares something in common with Jenga at its raw level, it is still quite a different game. The components have a very different look, obviously, and the way the balancing works is quite different as well. As mentioned already, in Suspend you are not working with a static tower, but the entire structure will move and change every time. This makes it slightly less predictable and even harder to assess what will happen each time you add a piece, but it also makes it more dynamic and exciting to watch and play. Fun: Anything that involves physically building something, and watching it tumble down, will create moments of tension (will it fall? ), moments of drama (will he succeed? ), moments of disaster (oh, it toppled! ), and it is moments like these that also create laughs and entertainment. 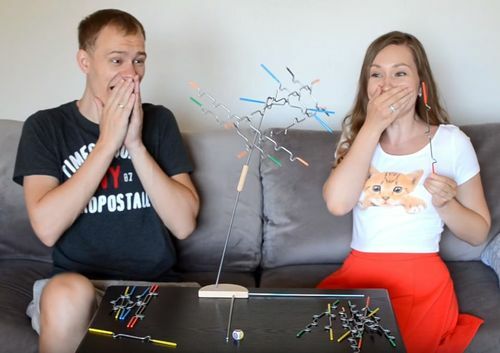 The dynamic structure can create gasps as each piece is added and the entire structure swings and changes, and also moments of laughter or frustration when pieces tumble off or the entire thing falls over. It really is just a fun game! Filler: I'm not sure that a game like this would provide a whole evening of entertainment - at least not with the same players. In most cases, Suspend will be a fun diversion while waiting for others to show up, or a filler between games or to close an evening. But certainly it would be a great choice for a party or family gathering, as a piece of entertainment that can be left set-up on a table somewhere, and played by different people throughout an evening. Randomness: If the game has a weakness, it is with the standard rules, which require dice rolling to determine what colour metal piece you have to place. This can add an element of excitement and suspense, because you don't know if you'll roll a colour that you actually have, meaning that you might be forced to play a piece from another player. It also creates a catch-up mechanic, because it is likely that someone who has collected a pile of fallen pieces will be helped out by other players and could get back into the game. But it can also be very frustrating when you don't roll the colour you need. This is a light game and shouldn't be taken too seriously, but gamers may find themselves adopting house rules to improve the "game" element. Kid-friendly: While certainly fun for adults looking for a light filler, Suspend is also going to work well for children. That makes it an ideal family game. You can even pit grandparents against grandkids as a good match-up! 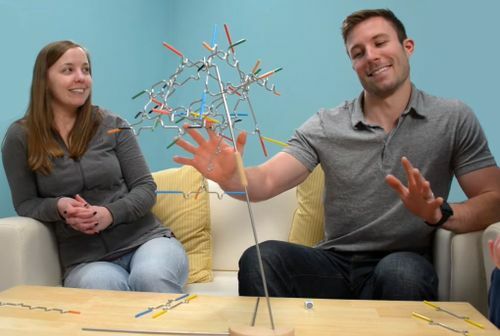 Many families have reported that Suspend was a great choice as a family game. Popular: Somehow a game that would normally be an underground hit at boardgame conventions, has hit the mass market and become a real hit. Suspend is very available, and you'll even see it on shelves in big box stores like Target and Walmart, and online retailers like Amazon. That's fantastic - I'm all for good quality games like this hitting the big time! 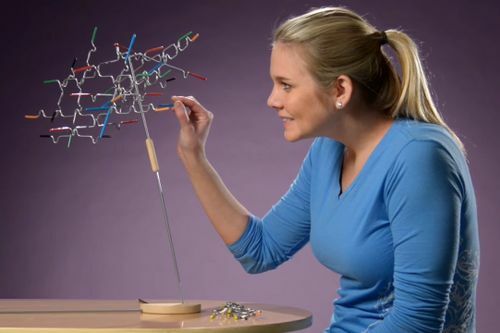 Award-winning: Suspend has won several awards in the toys and game industry, including Best Toys Guide's Best Game of 2012. So I'm by far not the only one blowing its trumpet and singing its praises - many others have done so already. Toy: Not everyone might admit to it, but it's fun just fooling around with the pieces of Suspend on your own. You don't even need to do an official solo challenge (although you certainly could), but the pieces and concept of the game is entertaining enough to mess around with, as you try getting all of them to balance in a single structure. 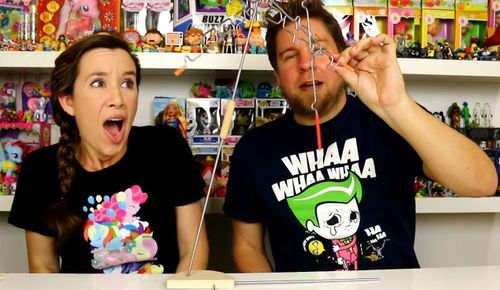 There's definitely a big toy factor, and not just kids will appreciate this! 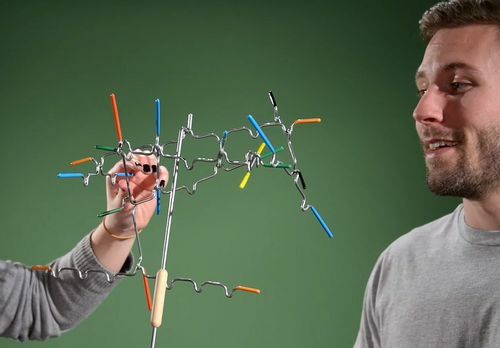 So even if you don't find enough game in Suspend, you'll have to concede that there's a lot of toy-like dexterity/physics fun you can have with it! Variations: The game comes with a few levels of play, but what it really needs are some good house rules and official variations, which can mitigate the frustration that can be caused by rolling the die. Many other players have remarked on this, and fortunately quite a few players have suggested different house rules that can help turn this from a good game to a great one. For example, Daniel Cluley suggests this variant: "If you roll a color you don't have, you get to pick one from an opponent to play, and if successful, trade one of your pieces for the one you played." Kirk Roberts has come up with a Color Force variant which seems quite good, and perhaps even better is the Pool of Points variant from VaultBoy. Others have suggested being able to place your final piece without needing to roll. None of this will probably matter to non-gamers, but I can understand that gamers will want a fairer set of rules that rewards skill and mitigates the dice-rolling. 1. "The game can be too easy for some players, and too easy to balance. As a result it can happen that the structure gets too solid with interwoven pieces, meaning that everyone can play all their pieces without any falling." Response: I also found quite a few critics saying that Suspend is too hard and too difficult to play! So evidently you can't take this criticism too seriously, and you will get mixed results. 2. "The rules as written need variations and house-ruling, to avoid the scenario where all players have placed all but one or two of their pieces, and it comes down to the roll of the die as to which piece gets played to determine the winner." Response: While there is merit to this, it's not reason to miss out on a fun game - just consider playing with some house rules. 3. "A potential concern about replayability." Response: Suspend is not intended to be played over and over many times on the same day by the same players, but as a filler or party game. 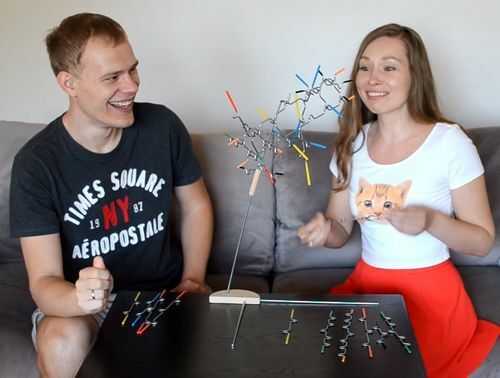 As you can see, even some of the critics still give Suspend some love, and consider it a fun game of dexterity and equilibrium, and have to admit that it can be a fun toy to play around with! So is Suspend for you? While it does have some weaknesses, particularly as far as rules is concerned, this is not a reason to stay away from it, because it's easy enough to play with whatever house rules you come up with. The central element that makes this game so much fun remains: the tense battle against momentum and gravity as you carefully position a new piece onto a swaying and volatile structure! The entertainment that this provides makes it more than worth any perceived issues. There are some real strengths here in terms of accessibility and appeal, and the amount of fun this game can produce for a wide range of people. For me Suspend is a keeper! Where to get it? 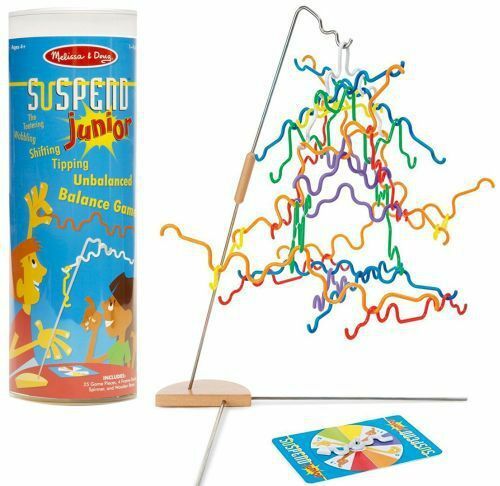 Suspend is available from most game retailers that distribute and sell Melissa & Doug products, and even from some department stores world-wide. For more information, see the product page at Modern Brands here. If you made it to the end of this review and found it helpful, please consider giving a thumbs up at the very top of the article, to let me know you were here, and to give others a better chance of seeing it. Thanks for reviewing this, Ender! We had a New Year’s Eve game night at our church. A couple had gotten this for their grandkids and they borrowed it for the evening. Several games were played and everyone seemed to really enjoy it! I know I did! LOL, the rods almost look like my set of lockpicks! How old would you suggest for kids? My younger boy, 4.5, likes dexterity games, but when we play jenga he still occasionally tries to reach for the middle block on a level that already has a side block removed. He moves on to another one quickly, but its clear he hasnt internalized static structures yet. I wonder if the joy of watching the structure move would overpower the frustration of watching the structure move. I've found that young players enjoy playing but quickly lose interest since the pieces can be hard to play successfully. 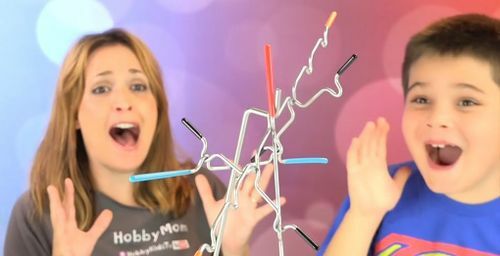 You might consider Suspend Jr, though - it's the same game but with plastic rods that aren't quite as slippery. There is a "junior" version entitled Suspend Junior, but it is difficult to recommend that version. The concept is the same but it has a cheap spinner (which admittedly might be more fun for kids than a die). 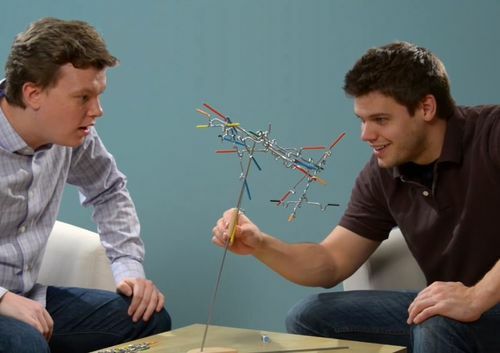 However, it uses cheap plastic rods, which unfortunately are harder to balance and increase the frustration levels. I'm sure it is still reasonable fun, and you will read positive comments about it too. But there are also many critical reviews on Amazon which suggest that it's not really more suitable for kids, and that the plastic bits slide too easily, making the game worse. 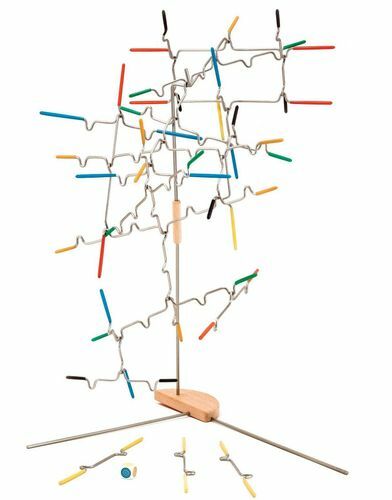 "I have the regular game and have enjoyed it with my great niece -- but I bought the Jr game for younger great nephews --- would not do that again -- the plastic pieces are actually harder to balance than the metal ones in the regular game." - Barbara J. In view of comments like these, I would suggest sticking with the standard game of Suspend if playing with children. You will read reviews from people who found the game too hard for kids, but these are often also people who found the game too hard for adults! If anything, the normal Suspend game is actually easier to play and less frustrating to play than the Junior version with plastic pieces. As far as ages go, I've read quite a few reports about children aged 4-7 who really enjoyed playing Suspend. Some four year olds will have more fun with it as a toy, playing with the pieces and building their own structure rather than following the rules, so there is an enormous toy factor they'll enjoy if they're not ready for the game itself yet. But once children are around school age, I think they should be able to manage quite fine with playing the game, and will enjoy it. Great review and thanks for the mention of my idea and the professional courtesy to notify me about the reference. I think this is a fun concept and the other rules we can develop may make it even more fun. I know I love experimenting with rules/mechanics/balance and I found a lot of cool options for making this game even better. Keep it up, everybody, that's what makes this fun!